1 Mix the maida with salt, oil, ghee and ajwain, combine to form a crumbly mixture. Now slowly add enough water to make a pliable dough, not too soft. Divide the dough and shape into balls. Keep aside covered with moist cloth for 15-20 mts. 2 Meanwhile, heat a vessel, add oil, add cumin seeds and allow to brown. Add the ginger, spice powders and a tbsp of water and saute for a few secs. 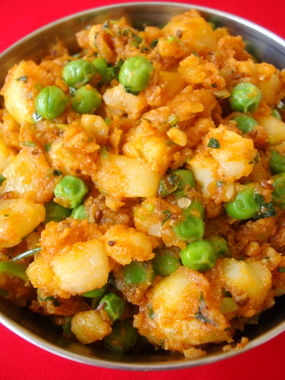 Add the crumbled potato and boiled peas and cook over medium flame for a few minutes, approx 3-4 mts. Add kasuri methi and lemon juice, combine. Add the coriander leaves and turn off heat. 3 Now that the stuffing is ready, prepare the outer layer for the samosas. 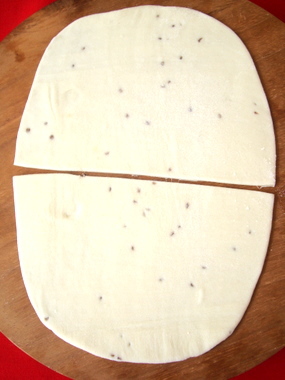 4 Roll each ball with the rolling pin into a slightly thin puri, slightly elongated in shape as shown in the image. 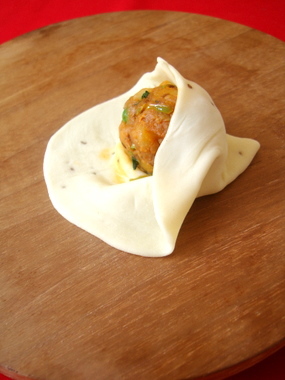 Take a knife and divide the rolled puri into two by cutting through the center. 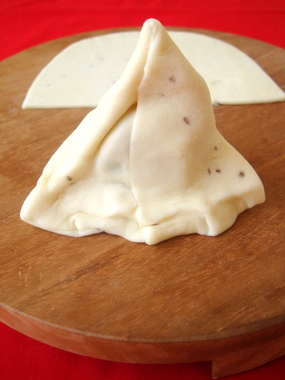 5 Now take a semi-circle piece of the roti, and make a fold in the shape of a triangle as shown in the image. Seal along the fold. Now place this cone between your thumb and index finger and place a ball of the stuffing inside. 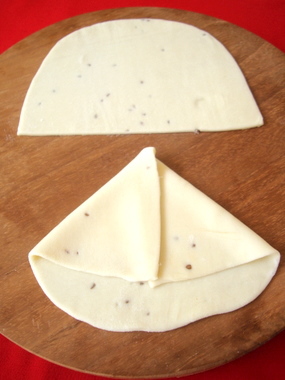 Wet your finger and run it along the edges of the dough with water and seal to enclose the stuffing. 6 Press the ends firmly so that the filling does not come out during the deep frying process. Prepare with the rest of the dough in the same manner. 7 Heat enough oil in a wide vessel to deep fry the samosas. Heat the oil till hot but not piping hot. Reduce flame to low medium and drop 2-3 samosas into the oil slowly and deep fry them till golden brown, turning them carefully to the other side so that it cooks on all sides. Deep fry on low to medium heat and not piping hot oil. 8 Remove onto absorbent paper and serve warm over a cup of chai. One of your ugadi pachadi photo is being used in TASC’s newsletter. I have forwarded that email to your gmail. I dont know if they have requested for that. I feel a lot of sorrow that your efforts are being misused by EENADU, SAKSHI and TASC. I am wondering why are you not using a software that displays a name on the pictures, many other bloggers do, and get rid of this painful experience? Picture perfect Samosas sailu garu!I wish i could grab one from the pic.I love Vizag’s manikanda bakery samosas near complex.I always try out with beetroot and peanuts like them but can never replicate their taste.Plz share that curry recipe if you tasted samosas in Manikanda.Waiting to know the recipe……..
Yay samosas! I love them, but never tried making my own. Will do now! Btw, they’re immensely popular in the UK, too. They’re almost everywhere! 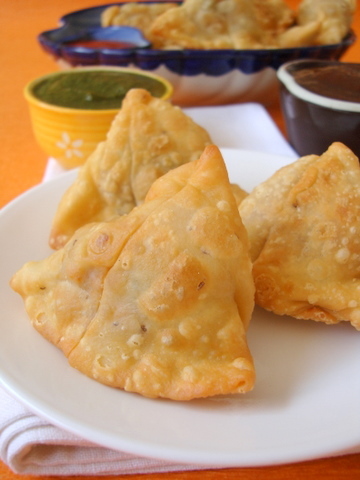 Samosas look perfect and gorgeous! You’re right – nothing like hot samosas on a cold rainy day! Hi , first time here..u have a nice blog and recipes r simply superb.. will surely try this samosa 2morrow and let u know 🙂 Thanks !! Love your recipes and presentation.Whenever I try to prepare Samosas they are becoming soggy after frying.Can you please let me know the flour brand name and the reason. You have to roll out the puri slightly thin but not too thin. Ensure the oil is hot enough and not too hot. When you add the samosas into the hot oil, reduce to low flame and cook them on low heat only through out the cooking process. Rolling too thin rotis or frying on high flame yield soggy samosas. These samosas look absolutely perfect. I must try this out. Thanks you for the photos of how to shape them. hey the samosas have come out so good..lovely clicks and love the step by step presentation..
thanks for sharing the frying tips of a crispy samosa. sailu garu u r god’s gift for all of us. Your husband is absolutely right. I ensure I do not add too much oil for deep frying. When ever I deep fry, once I finish preparing the dish, I prepare papad/vadiyalu in the same oil. The left over deep-fried oil, once it cools down slightly, I strain through a cheese cloth into a separate vessel. This left over oil is used for seasoning only in non-stick vessels. Whenever savories like Jantikalu and festival dishes are prepared, I dispose off the left over deep-fried oil that has been used for more than an hour or so (when making bulk quantities). Samosa presentation is good. I have a doubt, when you put potato stuffing ball in the puri packet stuff, will it stay in one place, can I stuff with the spoon? I don’t use if the same oil boiled more than two hours and it’s not good for health. If we won’t add enough oil when we are making dough specially for (samosa) they will become saggy. Yes, you can use a spoon. Yes, the stuffing shaped into a ball will stay in place and is less cumbersome. Wow , love samosas. This was an easy recipe. I made a couple of changes of own own and tried it out today. It turned out awesome. Thanks. Sailaja, what a lovely tutorial! The pictures are so good and I am sure many many newbies will be very thankful to you for this post! How much ghee should be used to prepare the dough? You can add either 2 tbsps of oil OR 2 tbsps of ghee OR 1 tbsp oil+1 tbsp ghee to the maida. Hello there..I stumbled upon ur samosa recipe while wondering what to do with some left over potato curry..ur way of making pastry is truly amazing..I’ve tried many samosa recipes but never got the shape right although the texture turned out good. I tried ur recipe and the samosas came out really well jus’ like the store-bought one..keep up the good work. Am a 29 year old from Vizag, a through-bred beach girl. I am doing my MS in USA and am not much of a cook….i must say, your website has hooked me onto cooking now….i try out dishes everyday and they come out just fine….this not only boosts my confidence, it puts tasty food in my husband’s platter….I miss Vizag a lot and wish i could get nice indian food here….thanks for posting nice recipes and wonderful pictures….u r tops!!! Thank you so much for posting so many vegetarian and vegan recipes. Thank you so much for all the simple, innovative and delicious recipes you post. I have tried most of them exactly as you mention, and have never been disappointed. Thanks to you that I learnt a lot of recipes and get lot of praises from friends and family. I have a question though, regarding samosas. I have tried them (and kajjikayalu) so many times, but never had success. I tried all consistencies of dough, soft and firm, medium, but no luck. All websites say that the dough should be pliable, but different people have different idea of what pliable means. Is it possible for you to approximately tell how much water should be added for how much flour, or some kind of test/indication to make sure the firmness of dough is fine. nenu mee samosa try chesa nu and it was soooo good that everyone liked it. Thanks for the recipes u post and i tried ur tomato peanut chutney, it turned out well and it became a part of our daily breakfast. I appreciate ur hard work and talent. Thanks for posting nice recipes for people like us. Thank you so much! I was looking at your other recipes,Kid zone and Suvastra…You are one talented woman! hi sailu, ur recipes seem yum. i browse ur site regularly.me always thinks how lucky nehal is for you must always have something exciting for him by way of fun grub.good for u.
for samosa, u said to use maida and within brackets said all purpose flour.but you probably overlooked the fact that these 2 ingredients are not the same. while maida is the plain flour, all purpose flour is maida(1 cup) + baking powder(1 tsp) + a pinch of salt. I love cooking and visited so many other websites for different recipes including some very renowned chefs… Inspite of strictly following the recipes, they did not turnout anywhere close to what was expected. I gave up and stuck to my traditional andhra vegetarian recipes for the past few years… One of my friends recently mentioned about your website and I thot should give it a try. I live in the US and the place where I live, its hard to get fresh Indian food.. So, I normally try to make all our favourites from scratch at home. I tried a few recipes of yours in the past month or so and each one of them has turned out excellent… I normally do not leave comments but this time wanted to make sure I did…. Your recipes and presentations are wonderful. Your instructions and measurements are precise. All your hardwork is greatly appreciated. me ilove your recipes. samosa bagunnayi.inka kottavi chepandi. For the samosas in the picture, did you use ghee or oil? I have made samosas with oil but they did not have that rich bubbly, darker color. Does using ghee instead of oil make them crispier? I used oil. The medium does not matter. The key is in the frying. Heat oil on high, reduce flame and wait for a minute or two and then add the prepared samosas and deep fry to a golden brown shade. Do not remove them till that color is achieved. 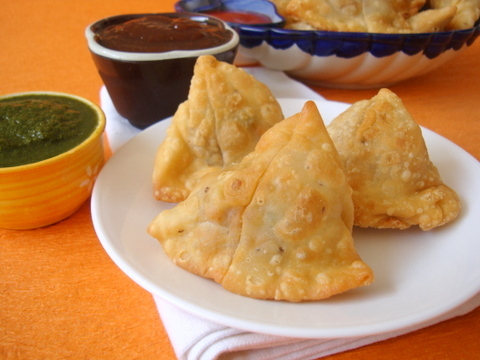 Can we prepare the samosas [morning] and keep it fridge and later deep fry in the evening? I always thought making Samosas was beyond me until I saw this recipe and found out they are not so difficult after all. Thank you, great recipe. 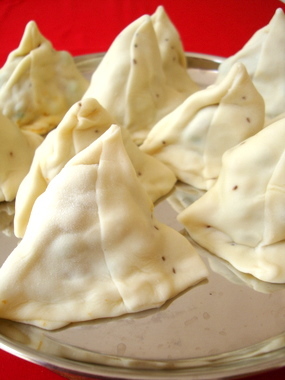 after making 100 pcs of samosa, if we want to use after two weeks where to put in deep fridge or chiller fridge at what temperature and what precautions to take at the time of frying? Try to cook it over medium heat instead of high heat. This is Jyothi.Very delicious recipe and mouth watering to watch the pics of samosas,stuffing is so colorful..delightful to watch.I appreciate your effort in posting a wide variety of different recipes. Today i tried.They came really excellent. i just can’t eat ghee.this recipe is north indian recipe.tats y u guys use ghee n garam masala.i love south indian’s samosa.spicy and surpeb.But im sure the north indians enjoys them n d south 2.me?. not sure cz i can’t eat ghee and garam masala.i love onions so much.they r superb. Could you tell me what kasuri methi is? Is there something I could substitute for it? Would it be OK to leave it out? I can’t find it in my grocery stores. If in US grocery stores it is in the spice aisle and called Fenugreek. I love this, it is mouth watering men. i love your recipes. they are so good. when i prepare my samosa they didn’t became tasty and doesn’t take that shape that had you shown in the pictures. your recipes are very tasty thank you so much for so tasty recipes. thank you so much for sharing this recipe!! it turned out perfect for the first time and taste and looks just like the indian grocer we used to buy from years ago that his wife hand made!! I have missed these and super excited I can make anytime now!! I will be doubling the batch next time and freezing some to cook anytime.